The Precision Machined Products Association (PMPA) reported that according to 67 members who reported solid figures — March was the best month for shipment volume since they have been keeping track. This is good data to keep track of. It’s more important I think than broad sentiment vibes from purchasing managers across the economy or bumpy employment numbers that the stock market traders focus on but which do not directly reflect the sweep of the economy. The winter certainly affected the first quarter in some negative ways, mostly retail, but the PMPA numbers show me that the cold weather machine guys find a way to get it done no matter what the external impediments cast in their way. David Brooks, the superb New York Times columnist, delivered a TED talk recently that really struck me. He said that he had been thinking about the virtues of the résumé and the eulogy. The “résumé virtues” are the skills you bring to the market place. The “eulogy virtues” are the deeper ones that would get mentioned in a eulogy. Who are you? What is the nature of your relationships? Are you bold, loving, dependable, consistent? He says most of us would say the eulogy virtues are the most important. But Brooks says, and I agree, that few of us spend a fraction of our thought and energy on them compared to the time spent on marketplace victories. Personally, I find my brain easily drifting into thoughts of deals and competitive advantage, even during my imperfect attempts at prayer. I highly recommend listening to the TED talk. It is short, pithy and unsettling. For many years, I have suffered from a form of migraine syndrome. Fortunately, I do not suffer from the headaches most people have, but I get the aura, sometimes called a scintillating scotoma, which is annoying because it interrupts my vision with a curved jagged image crossing my sight for almost exactly 25 minutes. My father dealt with scotomas for 40 years, so I was not terribly bothered when I started getting them. My son Ari also deals with them. I read an interesting piece this week in the Chicago Tribune about migraines. I have been trying to figure out what tends to trigger mine. Caffeine is considered a primary culprit so I have switched to decaf. Chocolate and red wine are also thought to be triggers, but the thesis of the expert quoted in the piece, Andrew Charles, professor of neurology at UCLA, is that migraine is a syndrome much bigger than nasty headaches. He says the reason we think chocolate is a trigger is that we crave chocolate in the neurological phase hours before the actual headache. Charles’ research has shown that you cannot fully prevent attacks, but if you keep consistent sleep patterns, shun caffeine, exercise regularly, and eat a consistent diet without a lot of sugary foods, you can minimize the misery. Lets hear it for decaf. I appreciate your comments on the last blog, even the negative ones that argued I was wasting your precious time writing about ping-pong. What struck me was that people cared enough to read the piece and tell me they were disappointed. They thought I could do better. That is a sincere compliment. “How do I get rid of the fear?” Alas, this is the wrong question. 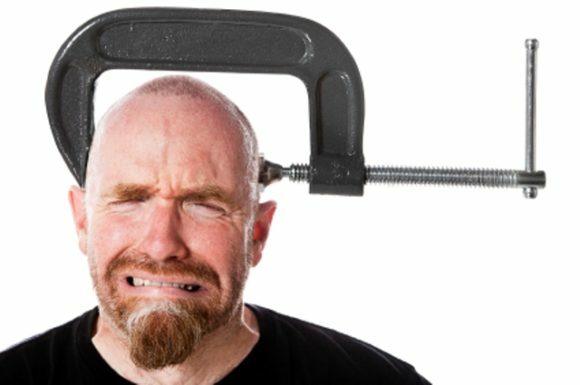 Question: What causes your headaches? Lloyd, nice to hear someone else has something similar to my own affliction. I’ve been diagnosed with “ocular migraines.” I don’t get headaches, but I constantly see little stars and floaters and have what they call “watery vision.” It’s not really debilitating but it is quite annoying. People always ask me why I wear sunglasses on cloudy days, it cuts through the stars. There is a difference between floaters and ocular migraines or migraine equivalents. Floaters are cellular debris suspended in the fluid of the eye or vitreous. They have various shapes, but usually appear cellular and are usually dark in color. They continue to move after the averting the eye has stopped moving, since they are suspended. They are are more obvious when looking at a light background. Ocular migraines on the other hand are visual auras that are produced by the occipital cortex, that subserves vision and are described as zig zag lines or fortification spectra as in a Roman Fortification or a broken glass appearance, sometimes coloured lights and bright spots. These occur sporadically, as a migraine would occur, but are not followed by a typical migraine headache and can last minutes to an hour with resolution. I have many bothersome floaters and have had ocular migraines, but fortunately never a migraine headache. I sought the Lord and delivered me from all my fears. Conversations like this give me a headache..
QC Mgr- To the production Manager, “The threads are missing from this batch of 3000 parts” (0-80 id threads , 4 per part).